Given Wales has far less coastline than its neighbours in Scotland (around 6,160 miles excluding islands) and England (8,982 excluding islands), it’s a pretty impressive feat. 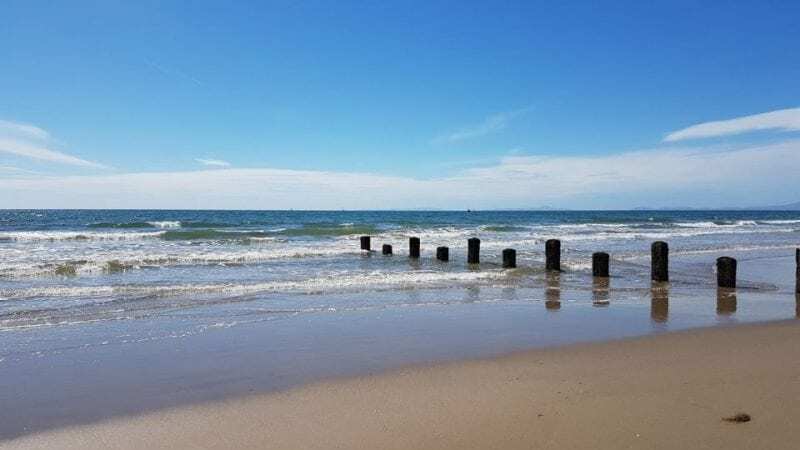 The coastline of Wales measures in at around 1,370 (excluding Anglesey) and was recently awarded a total 47 Blue Flag Beaches by Keep Wales Tidy. In addition to the Blue Flag Beaches, 19 other areas were awarded a Green Coast Award. A further 83 received a Seaside Award, which recognises the quality of the water and facilities. Having lived in Gwynedd on the North Wales coast for the past 3 years, I can personally attest to the quality of the beaches. Unfortunately, my local beaches didn’t make it to the list (WTF?). Harlech and Llandanwg might not have Blue Flag beaches, but they’re gorgeous all the same. Running for a total of 7km, this beach is popular with walkers along its promenade and for water sports enthusiasts, due to its lack of rocks. Tywyn is located to the south end of Gwynedd, on Cardigan Bay. I live 5 miles north of Barmouth and, in 3 years, I’ve been to the beach once. This is mainly due to the fact that it’s incredibly popular during summer and school holidays. There are times here when getting from one end of town to the other (less than a mile) is impossible due to the sheer volume of traffic. However, the reason the beach is so popular is that it’s so pretty. Barmouth Beach is nestled in Cardigan Bay and the town is part of Snowdonia National Park. The famous Three Peaks Yacht Race starts from Barmouth Bay each year and the beach and surrounding amusements and arcades are extremely popular with families. A few miles around the coast from the popular tourist town of Porthmadog lies Morfa Bychan. The densely packed and flat beach area means that you can take your car here, but do try to avoid any good sand castles if you do. Also known as Black Rock Sands, which sounds like something from a Pirates of the Caribbean movie, the beach is popular with kite surfers and dune buggy enthusiasts due to its flat surface. This also means that it’s one of the most accessible beaches for visitors with disabilities. Technically, the town of Criccieth has two beaches, as the coast is separated by the hilltop castle. However, the Blue Flag Beach award covers both parts. There’s a lovely promenade for wandering along and a visit to either beach (or the castle) offers gorgeous views. I personally like looking at the beach from the window of Cadwaladers Café as it sells ice cream and has massive picture windows backing on to the water. Just because you can’t pronounce it, doesn’t mean you shouldn’t visit. Pwllheli is a very pretty town, full of amenities and its beach is very popular with visitors. The Wales Coastal path runs through town and brings in many walkers. The beach itself is popular with families and there’s a skate park nearby. It’s also a draw for sailors and kayakers who make the most of temperate waters. Well, I say temperate, but I’m from Scotland, so everything’s temperate to me. If you can get parked in Abersoch in the summer months then you’re doing well. This is a seriously popular beach and it’s designated as ‘safe’, meaning it has no strong currents. The beach is a haven for sailors and surfers and has a popular water sports centre. If you have stuff with you, you can rent out a pretty beach hut for your stay. Local tourist boats can take you to the nearby islands of St Tudwal’s or Bardsey. Bear Grylls owns a small island here called St Tudwal’s West. He’s been annoying the locals by planning to build a harbour on it. It’s claimed that any building work would lead to erosion of the Llyn Peninsula on which Abersoch sits. Therefore, he’s coming up against some major objections. Aberdaron is located not too far from Pwllheli on the Llyn Peninsula. The beach has easy access (including disabled) and is known for its annual sailing regatta. The beach is sandy and the water scores highly for its cleanliness. The surrounding village is really pretty and there are shops and cafes to keep even the most restless visitor amused. If staying on shore isn’t your thing, you can take a boat trip over to nearby Bardsey Island. The beach also has a campsite nearby, should you wish to stay a little longer. Dogs are also welcome on the beach if they keep to the left of the slipway. Dinas is situated further to the north end of Gwynedd, close to the large walled town of Caernarfon. Known for its soft, sandy beach and clear water, Dinas is very popular due to its location, promenade and the availability for free parking. Dinas has a constant RSPB presence is designated as an area of special interest. This is due to the numbers of rare birds who nest here. On good days, the views from Dinas stretch out over the Llyn Peninsula to the Isle of Anglesey. A full list of awards across North Wales can be found HERE.